The rest of our first birthday week we wanted to take the look back at the last year and reflect! For each of us to have the chance share some highlights, and favorite moments, and behind the scenes. First up, Jenna! “I remember sitting at dinner with Nicole and Emily when this blog was conceptualized and even in my wildest dreams I couldn’t have anticipated what this year would bring for us, it’s been so exciting! I look back on this year of blog content I’m really proud that we’ve accomplished what we set out to create: a positive place that celebrates the joys of motherhood, children and family. 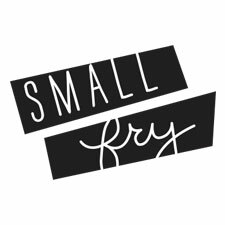 I’ve said it before, but you can find plenty of websites that give you the grit of motherhood, the negative side of having children, and the harsh realities of family dynamics, but Small Fry just isn’t that place. Trust me, we aren’t trying to dupe you in to thinking that our lives are all perfectly coifed children and DIY crafting because as you’ve read on our Frydays, we struggle just like everyone. Peach Basil Jam: This post was one of our very first. I love peach season, and I love being in the kitchen with my kids so it was especially fun to have all the boys helping in the process. I remember how excited they were that a couple days after making the jam we got them all together to sell it to their neighbors and friends. Their grandmas, cousins, friends came, and the boys just thought they were in Heaven! Seeing them so proud of their accomplishments was something I won’t ever forget. Even though the boys have grown so much since this picture, it captures their personalities so beautifully! They have been friends since birth, and that’s a really special thing. Adoption Week: This was a special week for me. I woke up one morning knowing that we should spend an entire week highlighting adoption stories, but being nervous to approach Emily and Nicole about it. I told them how passionately I felt about it, and they were both instantly on board. That’s what I love about our friendship. There is a deep level of respect that goes beyond any personal opinion you might have. If they feel strongly about an issue then the matter becomes important to me and I know that it goes vice versa as well. They were so encouraging, loving and supportive through the whole week. I can’t wait to make this an annual feature because the families stories were so touching, and the comments inspiring. Campover: One night we had my niece Arleigh over for a sleepover. We pitched a tent in the living room, draped twinkle lights over it for stars & made s’mores over our gas stove. It was so last minute and the kids just completely died over the whole thing. The next morning I called Nicole (who was conveniently my neighbor at the time) and she shot them having fun & playing in the indoor camp grounds we had built. I love posts like this where something magical happens in your home & we get to remember it forever through Nicole’s incredible images. Read all of Jenna’s personal posts, from FRYdays, to birth stories, to her own personal adoption story here. Follow along with Jenna’s everyday on Instagram @jennarammell. Just discovered your blog and I just like to come stare at it ’cause it’s pretty. 🙂 Seriously though, love it and as a new mom love the idea of a place to celebrate the spirit of kids! Congratulations! So awesome you guys have been around for a year! This whole week has been so great! Since I am new(er) to this site, it is fun to go back and discover past posts I had missed! Thank you. You ladies are doing an amazing job–congrats, happy birthday and keep it up!